The ZVH engine is a hybrid engine comprising of the 1.6, 1.8 or 2.0 Zetec block and CVH head. This guide has been prepared to share the information gained in building the ZVH engines over the years. Start with a Zetec black top engine due to the better positioning of the oil fiter and the first job is to completly strip the block, crank, rods and pistons. 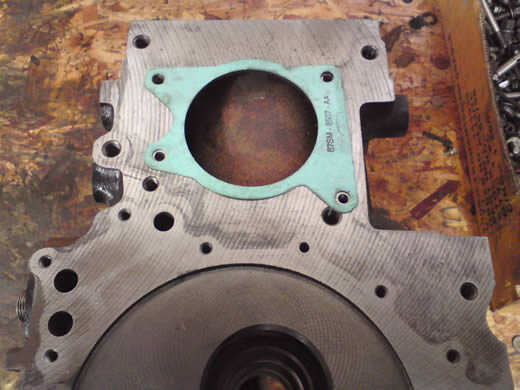 Fitting a CVH water pump on the side of the Zetec block, start by placing a CVH water pump gasket on the block lining up the top left bolt hole in the gasket with the M8 hole on the block, then mark the remaining 3 holes on the block followed by marking the large centre hole for the impellor. Drill out the 3 remaing mounting holes 5mm and tap the holes M6 x 1, you may break through into the water jacket when drilling these holes, just use a bit of sealant on the threads when assembling. To make the large impellor hole, line drill the marked out line then with a chisel lightly knock out the centre. Next with a die grinder remove all the sharp edges. You will also have to drill out the top left mounting hole in the water pump 8mm to accept the M8 bolt that fits in the block. 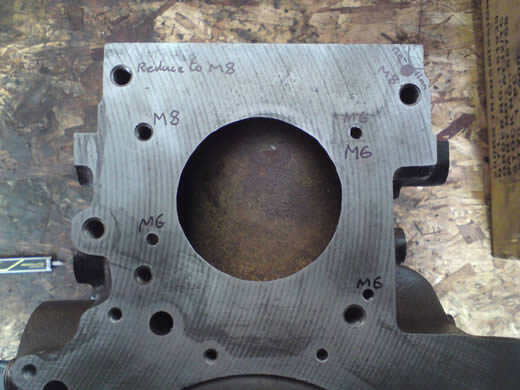 I fit a helicoil or a time sert to the already placed M10 hole on the top left of the Zetec block to reduce it to M8 to fit the tensioner, the front hole is carefully placed 11mm from the front of the block, this is a critical dimensiom, as if it is too far back it will interfer with the head bolt and 12mm down. On the front of the Zetec block there is a breather assembly that should be removed if using the std CVH exhaust manifold. You have to use a 40mm core plug not an aliminium blanking plate as it will prevent the exhaust manifold from sealing properly on the CVH head. When the above operations are complete you can clean the block inside and out. When bolting the CVH water pump onto the Zetec block use a spacer plate to prevent the CVH impellor rubbing on the outer cylinder wall. I also cut the back off the end of the rear slide hole on the tensioner to allow the tensioner to slide right back without interfering with the engine mount. I use my own design of head gasket which has a repositioned oil way and blanks off the unused Zetec oil drain holes. 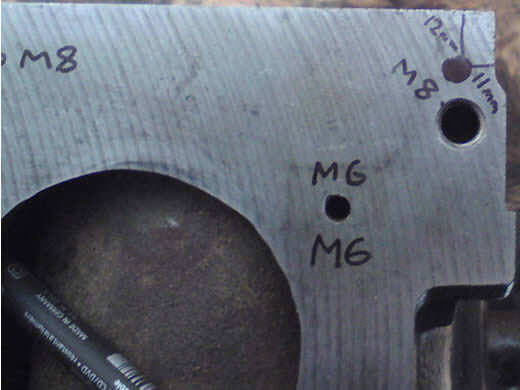 This is a re-usable gasket. I use high tensile bolts which are re-usable and 145mm long. Assemble with the thick CVH headbolt washers. Torque is 65 ft/lbs with ARP bolt lube. For the cam belt pully/drive assembly use the pressed steel CVH inner washer followed by the CVH bottom cam belt pully, then your choice of alternator pully. 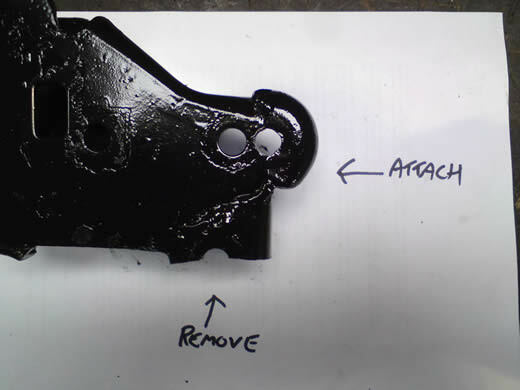 For the CVH camshaft pully you will have to use a vernier because the Zetec block is a different height to the CVH, meaning the crank timing mark and cam timing mark are half a tooth out of alignment, this is corrected by adjusting the vernier pully. You can use either the one piece aliminium sump or the two piece steel/ali sump assembly, this decision is based on what gearbox you are running. 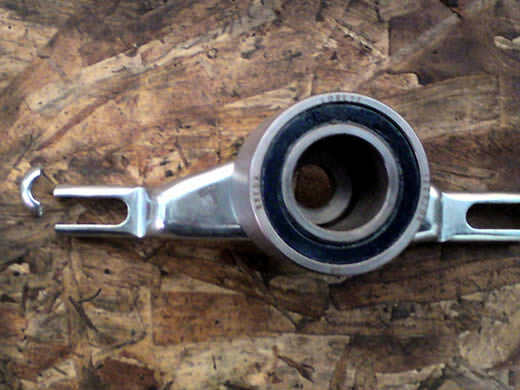 For turbo applications you will have to fit a drain back tube for the turbo drain. Also a good sized breather/drain tube attached to the rear. Use the CVH one that has been modified by cutting off a potion of the bottom lug and welding it the left side of the mount, then drill the rest of the hole 10mm. Fit the CVH mounting bolts to the 2 holes.